Why Is Espresso Growing in Popularity? About five years ago, espresso began coming into its own as a consumer-friendly beverage that could be consumed on a daily basis. American coffee drinkers began seeing espresso as an alternative to their lattes, cappuccinos, and even black coffee. Espresso is just as popular today, maybe even more so. So what gives? Why is espresso gaining ground over more traditional coffee drinks? No one knows for sure, but there are a lot of theories worth exploring. They cover everything from culture to health benefits and the global mindset. Our modern coffee culture was born out of the early days of the suburban coffeehouse made popular back in the 1990s. And just as we’ve seen with almost every other cultural movement in America, change happens quickly and frequently. Cultural movements work that way. What’s hot today becomes passé tomorrow and is eventually replaced with something else. The rise of espresso in America is undoubtedly influenced, at least in part, by the evolution of the coffee culture. 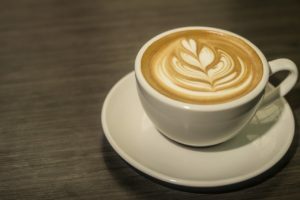 People have latched onto espresso as a drink that is distinctly different compared to regular black coffee served in a white cup with an accompanying saucer. The fact that one drinks espresso in 1-ounce shots rather than 8-ounce cups also plays into the coffee culture. It is seen as more sophisticated. It is seen as evidence that you are consuming bitter coffee because you actually like the taste. You’re not just trying to up the caffeine content in your blood. Medical science has come to understand that moderate use of caffeine does have certain health benefits. We will not get into those benefits here, as we have done so in a previous blog post. The point is this: American consumers are trying to live healthier lifestyles these days. Many see caffeine as a natural supplement that can be used daily to improve one’s health. And because espresso contains more caffeine by volume, one shot in the morning may be perceived as a healthier option to an 8-ounce cup of coffee. Finally, we cannot discuss the rise of espresso without exploring the global mindset. For the record, Italians have been drinking espresso for hundreds of years. It is not a new drink. Having said that, espresso wasn’t really popular here until five or six years ago. Some suggest this is because Americans did not begin to adopt a global mindset until the early 2000s. Drinking espresso may give some people a sense of being more connected to the global community. It probably also gives some espresso drinkers a sense of superiority or self-importance for thinking beyond America. It is easy to start thinking, after just a couple of shots, that the best coffee is found in Italy or elsewhere. Here at Galaxie Coffee, we are all about giving customers whatever kind of coffee products they want. Whether you prefer a light coffee shop roast or a dark, rich espresso, you can count on Galaxie to deliver. 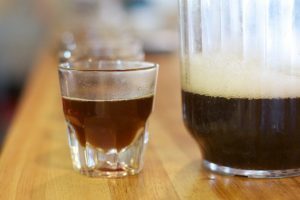 What’s the ‘Buzz’ about Coffee Beer? Have you ever combined two foods that an otherwise sane person would not think of putting together? In the 1950s and 60s we had milk combined with either Pepsi or Coke. The 1990s gave us peanut butter and hamburgers. And let’s not forget scrambled eggs and grape jelly, potato chips and Nutella, and ice cream and French fries. Oh, and how about coffee and beer? Coffee experts generally agree that the combination of coffee and beer began back in the mid-1990s at a company known as New Glarus Brewing. It was popular enough – a number of companies even tried to copy the original – though there was concern about how much caffeine was being offered in a beverage that addressed both ends of the upper/downer spectrum. Thus, coffee beer was not a market hit right away. Fast forward 10 years and you find a number of craft brewers who somehow came to a consensus about the caffeine and began making various iterations of coffee beer bearing their own labels. Now, some 10 years later, coffee beer is the latest big thing among both coffee and beer snobs. Prior to the introduction of the craft beer age, American consumers were limited to big corporate brands they could find at the local convenience store. But the craft beer revolution changed things. Not only did it give consumers more choices, it turned average beer drinkers into people who actually stepped back and paid attention to what they were drinking. Suddenly, everyone was a beer expert capable of discerning the finest notes and subtle hints of flavor. A similar thing happened in the coffee industry back in the late 1980s and early 90s. Coffee became a drink with the same kind of high-class following as fine wine and artisan chocolates. People began choosing their coffees based on all sorts of flavor profile preferences instead of just picking up the cheapest can from the grocery store. Somewhere along the way, someone discovered that both coffee and beer share a lot of intense flavors. The secret to producing great versions of both is roasting. Great coffee relies on great coffee beans roasted just right; great beer relies on how select grains are roasted. Combining coffee and beer seemed like a no-brainer when the flavor discovery was finally made. And the rest, as they say, is history. If you have never tried coffee beer before, you really should give it a shot. There are plenty of great choices to start with. Don’t worry about the caffeine content either. On average, coffee beer contains less than 50 mg per 12 fluid ounces of caffeine. That’s about one-sixth the amount of caffeine in a typical cup of coffee. Coffee beer is not something we deal in here at Galaxie Coffee. However, we do have a full selection of coffees, teas, and other brokerages for your break room. If you would like to know more, give us a shout anytime.